Do you have friends who think they might like to scuba dive, but just aren’t sure? Or know someone who wants to learn to dive but hasn’t been able to fit a certification course into their schedule? Perhaps you’ve been out of the water for a while yourself and need to brush up on your knowledge and skills. If so, then you’ll be happy to know that not only do scuba training agencies offer basic and continuing certification courses, but they also include a number of noncertification programs in their curriculums. It’s easy for nondivers of all ages to try scuba for the first time and for certified divers to refresh their skills or receive an orientation to new environments without completing an entire certification course. Whether these programs are labeled experience, recognition, noncertification, etc., they all have certain aspects in common. Generally short in duration, the programs often take less than a full day to complete. Participants dive under the direct supervision of a professional scuba educator. They do not earn a certification card and may not dive independently after the program. For noncertified divers, academic presentations delve into only enough theory to guarantee that students comprehend the importance of basic safety rules. Diving may be restricted to a pool or confined water (i.e., a body of water with conditions similar to those of a swimming pool). If open-water scuba is involved, it is commonly only a single dive or an option. Experience programs, while not as comprehensive as scuba certification courses, still require participants to be in good health. A medical questionnaire and release of liability form must be completed prior to beginning the course. Minors need permission from a parent or guardian. The best known type of experience program is the introductory or resort scuba course (“Resort” or “Intro”). These quick introductions to diving originated in warm-water scuba destinations so nondivers could experience the wonders of a tropical reef without spending their whole vacation completing a certification course. Resort courses are very popular and often result in participants enrolling in scuba certification courses after returning home. Similar programs are offered in more temperate locations as well, mostly in pool and confined-water settings. While each certification agency creates its own introduction-to-scuba program, the World Recreational Scuba Training Council (WRSTC, www.wrstc.com) has developed recommended minimum standards for introductory scuba experiences, as well as a number of certification courses. The knowledge portion of introductory scuba experiences may be conducted in a classroom, at poolside, on a dive boat or even online in advance. Because the lesson is limited to essential information, it is brief — usually no more than an hour or so. A short oral or written quiz confirms that important safety rules have been learned. WRSTC standards specify that the Intro lesson include the reason that breathing continuously is critical, how to equalize air spaces and basic hand signals for communicating with the instructor underwater. Also discussed are the importance of additional scuba training and dangerous aquatic life, if appropriate for the venue. Before diving with their instructor in open water, Intro students learn basic scuba skills in a pool or other confined water. Students practice breathing through the regulator, clearing the mask, equalizing the ears and mask and retrieving and clearing the regulator mouthpiece. All necessary equipment is supplied by the scuba center and, with minor exceptions, is the same as that used by students in a certification class. The open-water dive associated with the Intro course typically takes place immediately following the skill practice or the next day. Participants are directly supervised by their scuba instructor, who remains close enough to establish immediate physical contact should the diver experience a problem. An instructor may take no more than four students on their introductory dive tour or six with a certified assistant (i.e., divemaster, assistant instructor or equivalent), water conditions permitting. The maximum depth standard for Intro dives is 40 feet (12 m) and they may only be conducted during daylight hours. Minimum age for participation in an open-water dive is set by each agency, but is typically 10 years old. Pool and confined-water programs designed to introduce younger children to scuba are also available (see later in this article). Most scuba training agencies exceed the WRSTC minimum standards for introductory experience programs. PADI (Professional Association of Diving Instructors, www.padi.com), for instance, in its Discover Scuba Diving program, has participants in the pool-only experience also practice inflating and deflating the buoyancy compensator (BC) at the surface. Scuba Diving International’s (SDI, www.tdisdi.com) Scuba Discovery program also requires learning to use the BC in confined water. NAUI’s (National Association of Underwater Instructors, www.naui.org) Try Scuba Diving-Passport Diver Program (TSD/PDP) goes even further. During the pool/confined-water session, students breathe from the regulator underwater without a mask, share air from their alternate air source and monitor their own gauges. In NAUI’s two-fold introductory program, TSD participants may dive in the pool/confined-water only or elect to enjoy an open-water experience as well. For PDP divers, however, two open-water dives are required to receive a Passport, which allows the recipient to dive under direct supervision any time within six months of their initial PDP training without repeating the knowledge and confined-water portions of the program. SSI (Scuba Schools International, www.divessi.com) also offers two levels of introductory experience. Try Scuba takes place only in a pool and is open to participants as young as 7 years old, if they are sufficiently mature. 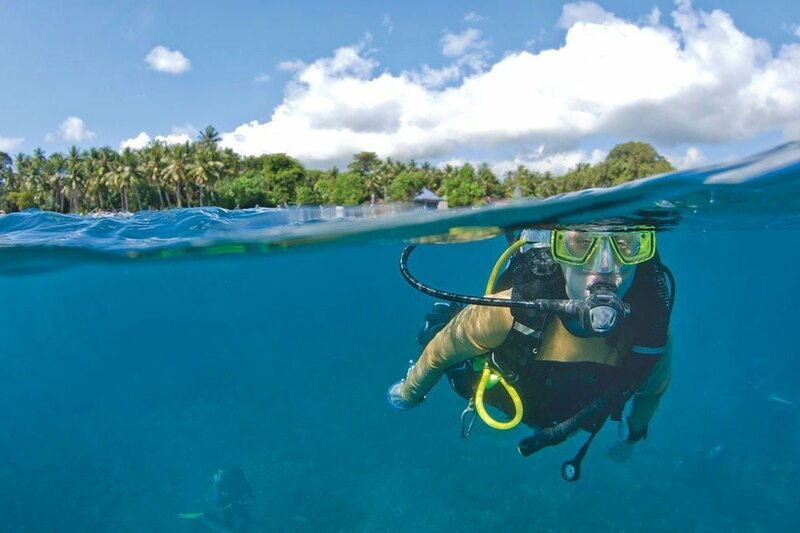 Try Scuba Diving is conducted in confined and open water; the minimum age is 10. Several scuba training agencies allow introductory divers to apply the knowledge and skills that they learn in the full Intro program toward fulfilling the requirements for basic certification. In general, the Intro program may count toward the first academic and water sessions, if applied within six months. NAUI has recently introduced a novel introductory scuba experience. Tandem Diver is conducted one on one — only one nondiver per instructor — or an additional diver with a certified assistant. It “provides a program that can be conducted for nondivers when confined water is unavailable.” Participants complete the same knowledge and water skill requirements as the TSD-PDP. The difference is that skills such as regulator and mask clearing and sharing air are performed at the surface before submerging for the open-water dive. The instructor directly supervises and controls buoyancy for the tandem diver. As mentioned previously, introductory scuba experiences are geared to those 10 years and up — old enough to enroll in a certification course. Although kids under 10 cannot become certified, they can experience scuba under very controlled conditions. PADI features two experience programs for kids 8 years and older. Bubblemakers wear standard scuba equipment sized to fit smaller frames. Before diving with their instructor to a maximum of 6 feet (2 m) in a pool or confined water, they are briefed on breathing, equalizing and clearing their mask and regulator. The instructor directly supervises a maximum of four youngsters (six with a certified assistant). Afterward they are recognized with a Bubblemaker certificate, card and emblems. The next step for 8- to 10-year-olds is to join a Seal Team. Members complete special “Aqua Missions” in a pool up to 12 feet (4 m) deep. The first five missions must be completed sequentially and gradually incorporate most of the basic water skills learned during Open Water certification, including buoyancy control and hovering. For instance, the Navigation Specialist Aqua Mission involves setting a compass heading, navigating a course correctly and estimating distance by kick strokes. Other missions include creature identification, simulated wreck diving, photography, skin diving, night dive (using a light), etc., all in the safety of a pool. The SSI Scuba Rangers program “provides children the opportunity to explore the underwater world by learning how to use scuba equipment.” Mature 7-year-olds and older may enroll. Scuba Rangers participants are encouraged to continue on to Junior Open Water Diver certification at age 10. The maximum depth is 12 feet (4 m) in a pool or confined water. After completing the development program, kids can advance to Intermediate Scuba Ranger by doing two Scuba Rangers specialties. Advanced Scuba Ranger requires four specialties and the Master level is eight Scuba Ranger specialties, including rescue/safety. Specialties include nitrox, navigation, buoyancy and simulated night, deep and shipwreck dives. In addition to experience programs for kids, other unique experiences are available for those interested in getting their feet wet in scuba. Among its noncertification programs, NAUI lists Supplied Air Snorkeling. Open to all age groups, qualified NAUI instructors teach and supervise the use of equipment that is a hybrid between scuba and snorkeling. Supplied Air Snorkeling for Youth (SASY) and its adult counterpart, Scuba Air Snorkeling, consist of a personal flotation device rigged with a scuba cylinder and regulator with pressure gauge. Participants become comfortable breathing compressed air through a scuba regulator and keeping their faces in the water while remaining safely on the surface. The Diving Equipment and Marketing Association (DEMA, www.dema.org) sponsors the “Be A Diver” program at boat, travel, sports, water and adventure shows across the country. The centerpiece is a large portable pool that is trucked to various events. Attendees are urged to don scuba gear that is provided and try scuba in water 4 feet (1.2 m) deep (see sidebar on Page ??). Nondivers are not the only ones who benefit from noncertification programs. These supervised scuba experiences are designed to renew the skills of certified divers after a period of time without diving or to help them safely explore new dive sites without completing a lengthier course. Since the programs are primarily designed for remediation and orientation, advanced and specialty certifications are recommended for those who expect to dive regularly without professional supervision. Experience programs meant to renew rusty skills are called scuba reviews, refreshers, tuneups or updates. Regardless of the name, the primary purpose is to assess a certified diver’s current skill level and, if necessary, help him or her return to the level of proficiency enjoyed at certification or when he or she last dived. Review courses can also be used by scuba professionals to assess the readiness of a diver for an intended dive activity; as preassessment for a continuing-education scuba course or upgrade from Junior Diver; or to confirm the skill level of a diver who has lost his certification card prior to reissuance. SSI calls their refresher course the Scuba Skills Update. Since the participants are certified divers, a Dive Control Specialist (DiveCon) or instructor is permitted to conduct the training, which may be completed in a pool, confined water or open water. Entry-level scuba knowledge is reviewed with students, followed by observation and evaluation of skills performance. Open Water students who completed their academic and confined-water sessions more than six but less than 12 months prior may take the Update program to prepare for open-water completion dives. PADI’s Scuba Review requires a written or online knowledge quiz as well as skill performance in a pool or confined water; an open-water dive is optional. The skills evaluated depend on the reason for enrolling in the Scuba Review; certified divers refreshing their skills review and perform all Open Water Diver skills. Upon completion updated divers are issued a recognition decal for their certification card. The Refresher Scuba Experience offered by NAUI requires passing an entry level scuba diver exam and satisfactorily performing all the skills learned in the Scuba Diver course. Following the evaluation the NAUI instructor tailors an individual’s dive activities to focus on skills and knowledge appropriate for the destination and type of diving intended. An open-water dive is optional. In addition to refresher programs, two other experience programs for certified divers are worth noting. The purpose of PADI’s Discover Local Diving (DLD) program is to provide a supervised orientation to unfamiliar dive sites. It involves a thorough site briefing followed by an open-water dive guided by a PADI divemaster, assistant instructor or instructor. The briefing includes an overview of the site, hazards, expected water conditions, things to look for and tips on proper interactions with aquatic life. The guide will also discuss local diving procedures and etiquette. NAUI’s International Diver Recognition Program offers divers the chance to gain additional open-water experience in new locations and conditions under professional supervision. However, it differs from PADI’s DLD in that the dive(s) “are to be conducted in waters other than those of the participant diver’s country of residence.” Participants receive recognition materials that can be used to verify their experience for future dive operators and educators. If you have friends or relatives who want to try diving, tell them how easy it is to participate in an experience program through a local dive center — or better yet, contact your dive center for them. And do yourself a favor. If you haven’t dived in some time, sign up for a refresher program while you’re at it. Expert swimming skills aren’t required for scuba diving. If you are comfortable in and around the water, give scuba diving a try. No. Your instructor will teach you how to equalize the air spaces in your ears and sinuses to avoid discomfort. For starters, scuba cylinders are filled with air — the same as what you are breathing now — which is filtered and compressed. You will have a gauge (just like the fuel gauge in a car) that displays your remaining air supply. Your instructor will help you monitor the gauge to avoid running low. Only if you are really, really lucky. DEMA created the Scuba Pool Tour in 2000 to increase the number of individuals exposed to scuba and encourage them to try scuba in the safe confines of a 4-foot- (1.2 m) deep pool. Since renamed the Be A Diver Pool, the 20-by-30-foot (6 by 9 m) attraction travels to a variety of multiday events attended by active individuals — boating, sports and travel shows among the most popular. The 15,000-gallon (56,850 liters) mobile pool comes complete with its own dressing rooms, towels, air compressor, latest model equipment and a pavilion for registration. Although a DEMA representative accompanies the pool on its journey, it is staffed at each location by dive professionals from local scuba centers. The Be A Diver Pool has introduced scuba to thousands of prospective divers at hundreds of indoor and outdoor venues. For information on Be A Diver Pool stops in your area, contact your local dive center or visit www.beadiver.com.